IDLO and the European Bank for Reconstruction and Development (EBRD) hosted a three-day Judicial Conference on Insolvency Matters in Croatia from 25 to 27 October, in partnership with the Croatian Judicial Training Academy and High Commercial Court of Croatia. 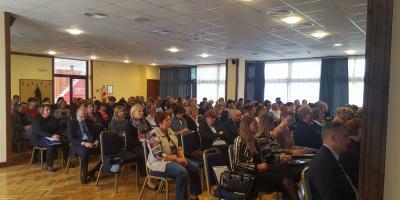 The conference is part of IDLO’s first project in Croatia, which aims to enhance the capacity of Croatian judges to handle insolvency cases, and was attended by 170 judges and stakeholders from the Croatian High Commercial Court, other commercial courts, the Ministry of Justice and the Judicial Training Academy. Since becoming the European Union’s 28th member in 2013, Croatia has been experiencing economic growth after years of recession. In terms of its enabling legal environment, Croatia’s commercial courts have been committed to strengthening the capacity of its judges to resolve cases related to insolvency matters by implementing training since 2010. Still, the importance of the legal framework on insolvency law and the ability of Croatian judges to handle them has emerged as a priority in order to sustain and build on the country’s progress to date. IDLO's Regional Director for Eastern Europe and Central Asia speaks to Kim O'Sullivan, EBRD, and Dražen Bošnjaković, Minister of Justice of the Republic of Croatia. The Judicial Conference on Insolvency Matters addressed challenges and best practices relating to insolvency with the aim of identifying existing issues within the legal framework and building the capacity of judges to handle cases. The program themes ranging from creditor’s rights, bankruptcy and land registry, the role of financial agencies in pre-bankruptcy and bankruptcy proceedings, and rights of secured guarantors. To broaden the scope of the importance of a strong insolvency legal framework in Croatia, discussions included a cross-border perspective with examples of creditor’s rights from the European Union and Germany. “This conference attracted Croatia's leading insolvency law experts and also a highly qualified German judge, Eberhardt Nietzer,” commented Fred Houston, IDLO’s Regional Director for Eastern Europe and Central Asia. Conference participants shared experiences and best practices. By convening stakeholders from different institutions, the conference aimed to promote a uniform approach to bankruptcy proceedings and strengthen cooperation between judges, as well as between other practitioners involved in the insolvency legal framework, such as Croatian banks and bankruptcy managers. Following the conference, the project will focus on future support for Croatian judges, including handbooks and materials, for continued and strengthened knowledge on insolvency legal issues.